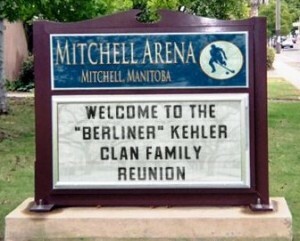 In August, the Kehlers held a one-day reunion in the Mitchell Arena, near Steinbach. Both physically and symbolically an arena is the proper place for a Kehler clan reunion. 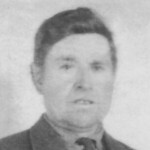 I never knew my maternal grandfather Jacob K. Kehler, who died four years before I was born. And yet, I’ve often felt that he knew me, that he has lived inside me all these years, inspiring my love language, firing my bursts of imagination, shaping my temperament and slyly stimulating my fondness for verbal acrobatics and the telling of tall tales. Why do I make this somewhat bizarre claim? 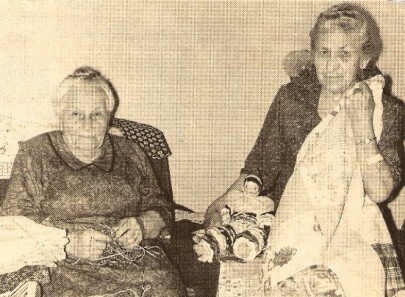 Because the older I get the more strongly I can feel my immediate begetters, my parents and grandparents, wrapping themselves ever more tightly around my own identity–like those Russian (babushka) dolls that fit so snugly inside each other. And the more I think and learn about those begetters, the more intimate that feeling becomes. And the more richly satisfying the process of self-exploration becomes. At the 1979 Berliner Kehler Family Reunion, Mitchell, Manitoba, the following comical Low-German poem about the eleven Kehler siblings was read by the poet Gustav Dueck, husband of Betty Stoesz Kehler. 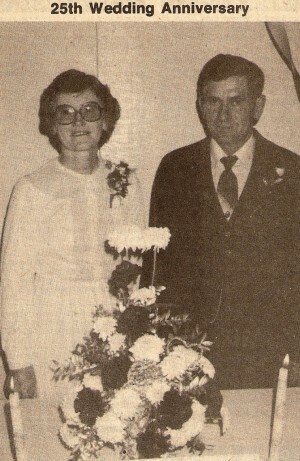 Mr and Mrs Bill Kehler celebrated their 25th wedding anniversary at an open house Sunday, October 21, 1979. Approximately 200 relatives, friends and neighbours were present for the short program and luncheon. 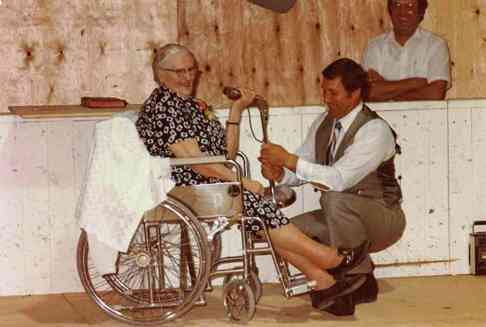 They were presented with many lovely gifts and a sum of money. All of their children and grandchildren were present for the occasion. Steinbach 42nd Annual Pioneer Days kicked off with the parade again this morning. 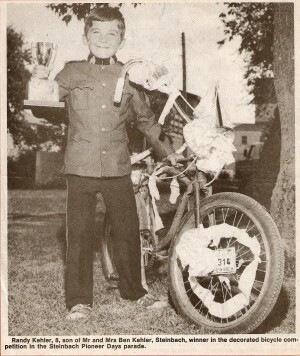 Back in 1974, Randy Kehler, 8, son of Ben & Martha Kehler was the winner in the decorated bicycle competition. Who doesn’t have a memory from the famous Edgar’s Diner? 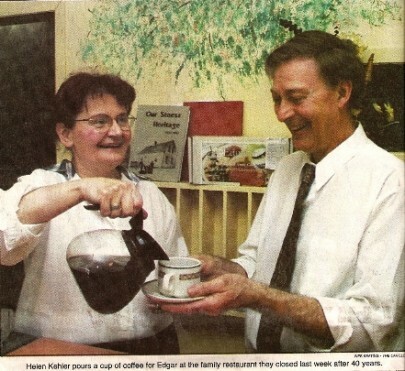 Today, on the 4th anniversary of his passing, we honour Edgar Stoesz Kehler, whose Berliner personality ignited conversation and laughter, and who loved to serve up a bowl of Borscht, a Husky Burger or a tasty veal cutlet. 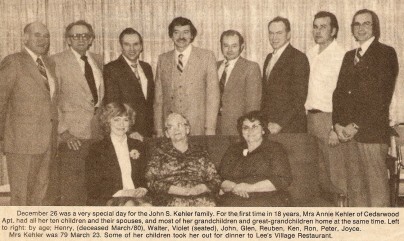 It’s speculation perhaps, but if “Berliner” Kehler’s political favour rested within the boundaries of the Conservatives, how easily would he have crossed the room to support strong ties with that of his descendants? 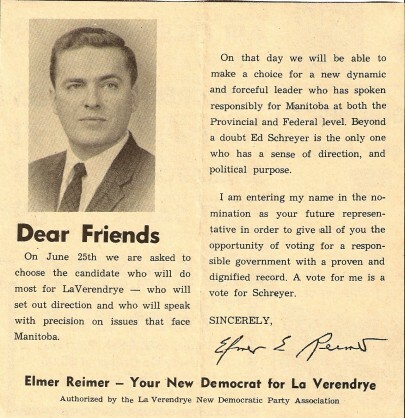 In 1969, Ed Schreyer persuaded Elmer (Al) Reimer, 42, grandson of “Berliner” Kehler, to run in the La Verendrye riding, which included Steinbach. Al Reimer had respectable academic credentials, elevating NDP favour. While English Professor Al’s political career failed to get off the ground, his academic career was later deemed highly successful. This ad was found in The Carillon News, June 1969. Author BerlinerPosted on January 27, 2010 December 23, 2015 Categories Kehler KlippingsTags Elizabeth S KehlerLeave a comment on Conservative or New Democrat?